WHAT CAN I DO TO INCREASE SALES OF THE CAR? Re: WHAT CAN I DO TO INCREASE SALES OF THE CAR? While listening to NPR's Wait Wait … Don't Tell Me! on their Website today, I was surprised to hear and see a Mitsubishi i-MiEV ad! Opening the media player several times resulted in Toyota ads as well, but it seems that i-MiEV ads play as often as the Toyota ads, so there is some decent exposure there. 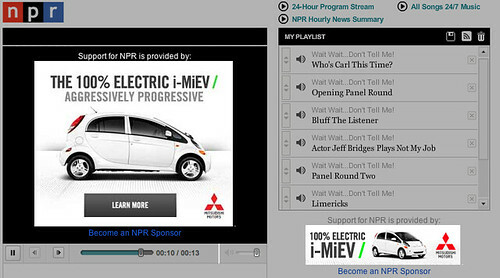 NPR listeners are probably a good target audience for the i-MiEV. Let's hear and see more of this! alohart wrote: While listening to NPR's Wait Wait … Don't Tell Me! [/url] on their Website today, I was surprised to hear and see a Mitsubishi i-MiEV ad! I feel really bad having to point this out, alohart, but I'm guessing the overwhelming majority of visitors won't see that ad. You're being tracked, and the ad's targeted to you because the site ties to a service that identifies you as someone interested in the i-MiEV. I see the same sorts of things all over the web. BTW, this demonstrates how badly this kind of micro-targeting can miss the mark - we already own the car, so the ad buys are wasted. Ok, it's happened. You can now get a LEAF cheaper than an iMiEV, and it's made in America. HowEVer, one can't ignore the value of the last 16,000 miles of use, at positive cash flow. Waiting another year for a bargain LEAF wouldn't have been near as much fun! Vike wrote: I feel really bad having to point this out, alohart, but I'm guessing the overwhelming majority of visitors won't see that ad. You're being tracked, and the ad's targeted to you because the site ties to a service that identifies you as someone interested in the i-MiEV. Ah, you're probably correct although I have a "do not track" header sent with every Web request (which advertisers are free to ignore) and run Ghostery to block tracking as much as possible. With the Leaf S priced lower than any i-MiEV starting this spring, Mitsubishi must do much more than just advertise to compete successfully. Mitsubishi missed its opportunity when the i-MiEV was the least expensive EV. I'd like to point out that improving the efficiency of the *car* would sell more, because the range could be significantly improved. If the i MiEV was as low drag as the EV1, it would have a range of 98 miles or so. jray3 wrote: Ok, it's happened. You can now get a LEAF cheaper than an iMiEV, and it's made in America. I've started another thread on this specific issue (though obviously relevant to this topic as well). I couldn't agree more (about it being less fun to wait yet another few months for the cheapo Leaf), though here in New Mexico I wasn't able to get the i-MiEV I wanted until after Labor Day (Mitsu did a terrible job filling pre-orders, a few folks were able to walk in off the street and buy one off the floor before I got mine, but none exactly matched my order sheet). I'm comfortable with the car's value to me for the price paid, and so far have really enjoyed owning and driving it. Personally, I prefer the cheerful utility of the i's character to the Leaf's bland franco-futurist sculpting and game controller interface, though I freely admit that's a matter of idiosyncratic taste. As long as I can keep it running at reasonable cost (mainly hope the mechanicals don't wear out too quickly and can be fixed at less than extortionate prices), I see no reason to part with it any time soon unless some avid car collector were to offer me a good price to own a little EV history (not holding my breath on that one ). "bland franco-futurist sculpting and game controller interface" -gotta love that review!! Our car just dropped off the radar of the leading eco-car buying guide. After being named Greenest Car of 2012 the i-MiEV was not even mentioned in the 2013 list or press release "due to anticipated low sales volumes", yet they list the compliance-cars Fit and Focus. Talk about your self-fulfilling prophecies- time for some letters to the editor! jray3 wrote: After being named Greenest Car of 2012 the i-MiEV was not even mentioned in the 2013 list or press release "due to anticipated low sales volumes", yet they list the compliance-cars Fit and Focus. Talk about your self-fulfilling prophecies- time for some letters to the editor! Maybe - but letters to MMNA would be more to the point. Don't get me wrong, I am so happy that unlike actual compliance cars, the i-MiEV wound up for sale nationwide, so I was able to get my hands on one in lil' ol' Albuquerque (where the Prius Plug-In is still nowhere to be seen). But the reality is that selling less than 800 cars all year through that nationwide distribution is beyond pathetic - those are below compliance-car volumes, after all. That's why, given the bare facts, my gripe is less with the Greenest Car editors and more with MMNA execs. I still don't understand why Mitsu did so little to announce the existence of this car (notice I don't even say "promote"). The only ads they ever ran were those little Normal EVtown spots, which never named the car, never mentioned its price, didn't even indicate that it was available for sale beyond some oddball test market in Illinois (watch those ads again - that's exactly the impression it creates). If this wasn't a compliance car, I'm not sure what Mitsubishi was trying to accomplish. The most credible story I've heard so far is that Nissan set the U.S. price for the Leaf lower than Mitsubishi had expected, and they were stuck at the end of an expensive development program with a less appealing car that cost so much to build that they couldn't sell it profitably at a competitive price. In other words, they had to sell 'em at a loss to sell 'em, and they sure weren't going to spend advertising dollars trying to boost those transactions. While I sort of understand that story, it doesn't jive with later statements that they were "disappointed" by sales and had to "re-think" their electrification plans; at the end of the day, I think the "losing money" story is close to the truth and their more recent statements are part of some scripted performance justifying actions planned long ago. That's the real self-fulfilling prophecy. We should probably count ourselves lucky that we wound up getting our neat little 'lectro-buggies at a price subsidized at so many levels.